The First Coast Wind Symphony with JU Prof. Artie Clifton conducting. The Jacksonville University Performing Arts Series will present the First Coast Wind Symphony featuring winners of the 2017 Concerto Competition for High School and Collegiate Musicians at 3 p.m. Sunday, April 23, in Terry Concert Hall. The concert is free to the public. 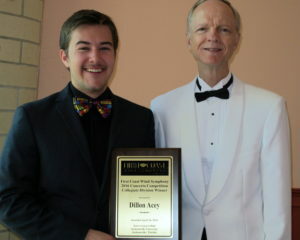 This seventh annual concerto competition was open to all students throughout Florida. The winners each receive a $1,000 prize and an opportunity to perform as soloist with the First Coast Wind Symphony. A free trip for two to Paris in November will be raffled at the concert. Tickets can be purchased at the concert. 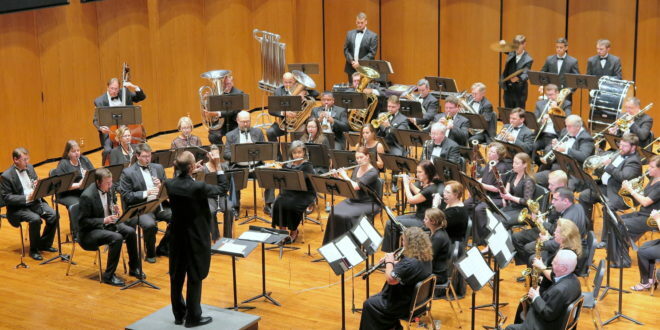 The First Coast Wind Symphony, a 50-member community music organization led by music director Artie Clifton and conductor Paul Weikle, is in its 27th season. The ensemble provides a cultural service by offering free concerts of quality wind music throughout the greater Jacksonville area. The group also supports music education efforts in local schools. The FCWS has released three albums to wide acclaim, Prevailing Winds, A Christmas Celebration and Symphonic Spirit, and a DVD titled Sounds of the First Coast. The group is a member of the Cultural Council of Jacksonville. More information is available at www.fcwinds.org. Visit jutickets.com for ticketing and further information. For more information, contact: Artie Clifton 256-7386, aclifto@ju.edu.